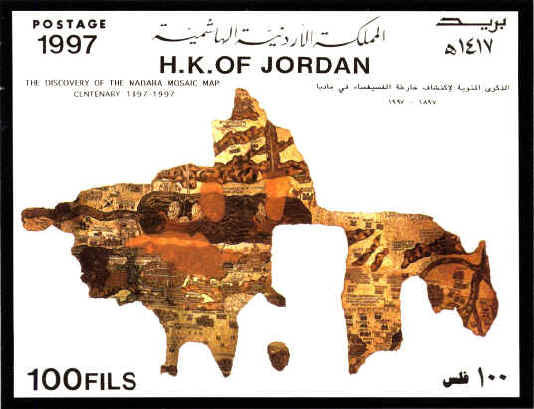 During the reign of the emperor Justinian (527-565), a mosaic map was created for St. George’s church in Medaba, forty miles south of Amman, Jordan. 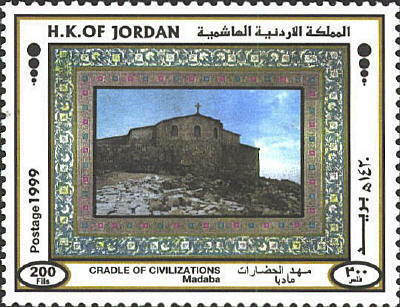 After the rise of Islam the Christian community in Medaba declined and ceased to exist, and the church was abandoned. In the 1880’s the map was rediscovered during the restoration and reconstruction of the church with the permission of the Turkish government. Although it had been damaged it included all of the Holy Land from the Mediterranean Sea to the transjordan, and from Egypt to Upper Galilee. 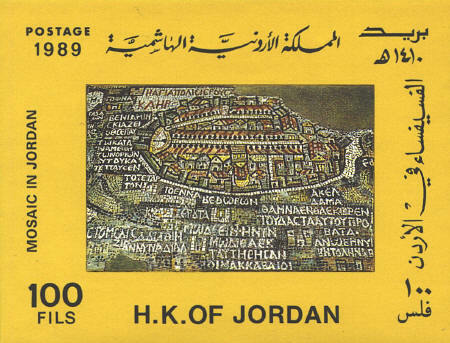 When Father Kleopas Koikylides, the librarian of the Greek Orthodox Patriarchate of Jerusalem came to Medaba in 1896, only about 30 square meters of the mosaic remained intact. The rest had been destroyed by time, iconoclasts, and the restoration of the church. 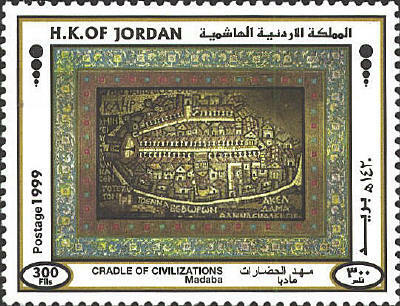 Jerusalem is the center of the map, and is shown on several stamps which feature the mosaic. 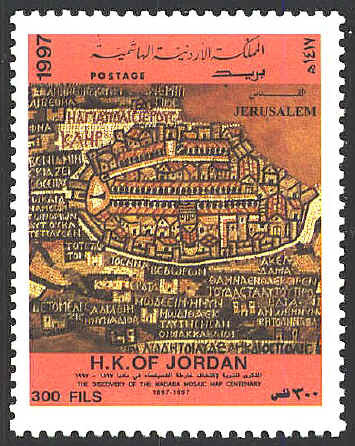 Many landmarks of Byzantine Jerusalem are identifiable. The Damascus gate at the left edge of the city, the colonnaded street across the city, known as the Cardo, and the Church of the Holy Sepulchre at the lower center, are among the places that can be identified. The map covered the transept in front of the altar of the church, and is oriented to the land itself, approximately 150 square meters in its original state. It required over two million mosaic cubes to tile it. An artist could place about 200 cubes an hour, so the mosaic would have required over 10,000 hours to complete. It is the most exact map of Palestine before the cartography of the nineteenth century. 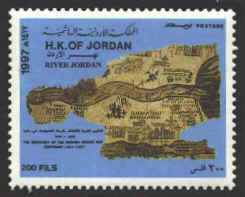 The map shows a great deal of detail as the three stamps above show. 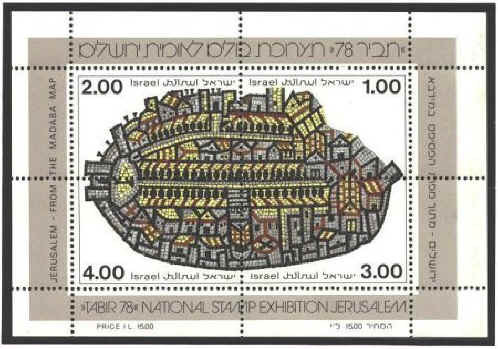 For example, the stamp from Argentina shows details from the lower part of the Jerusalem medallion, including the Church of the Resurrection (yellow at both ends) and the baptistery of that church (with the gray "x"). To the left of the Church are the Patriarchal Palace and the Monastery of the Spoudaei.